The illustrated Schrade knife is the Schrade SCHF16 Knife that features a 3.1" clip point fixed blade made of 9Cr18MoV stainless steel. 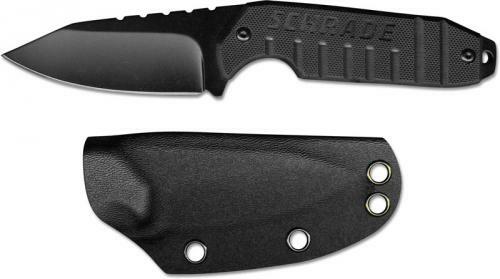 The blade of this Schrade knife has a non reflective black finish and a notched thumb rest for secure grip. The SCHF16 Knife has full tang construction for strength, milled black G10 scales and an extended pommel with lanyard hole. A thermoplastic neck sheath is included with this Schrade knife. The Schrade SCHF16 Knife has an overall length of 7", and it weighs 4.6 ounces.